When you hear the word “orthodontics,” what comes to mind? Probably a young teenager whose teeth are covered by a latticework of metal. There are indeed many orthodontic patients who fit that description. However, there now exists an increasingly popular alternative to traditional metal braces: Invisible Clear Aligners. Here's how it works: Specialized computer software is used to design a plan for moving your teeth from their current positions into the best possible alignment. This movement will be broken down into perhaps several dozen stages. 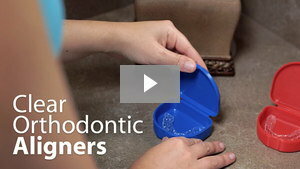 For each stage, the clear aligner company will manufacture two plastic mouth “trays” or “aligners,” one to fit over your top teeth and one for the bottom. You will wear this first set of trays for two weeks, for a minimum of 20 hours per day. You will then move on to the next set of aligners in your series to accomplish the next stage of gradual movement. You will keep doing this until your teeth are correctly aligned. As mentioned above, one of the main advantages of the clear aligner system is that the trays can be removed for easy cleaning. So please don't neglect to do this! You'll need to brush your teeth after every meal or snack so that food and plaque do not get trapped in the aligners, which could promote tooth decay and gum disease. Your aligners, too, will have to be cleaned regularly; you can do this by brushing them and then rinsing them with lukewarm water.